After an unusually high estimate for replacing windows, many homeowners have considered a do-it-yourself window replacement. The process of replacing your own windows is pretty much the same as professional window companies do, but with fewer bells and whistles and a lot more uncertainty. Let this guide dispel some of the mysteries of self-window replacement and help you along your way to less expensive window installation. The windows that are readily available on the shelves of Home Depot, Lowe's, and builder's supply houses are likely the wrong kind of window for you. Typically, these are new-construction windows meant for new homes or extensive remodels that involve radical exterior changes. They have nailing fins attached to the window perimeter that allows the window to be nailed flat against the outside of the house. The type of window you want goes by various names: replacement window, pocket window, or insert window. It has no nailing fins and is meant to fit into an existing frame. Begin by working from inside the house. The sash is the part of the window that moves. The stops are those thin, vertical pieces of wood or vinyl that prevent the sashes from falling inward into the house. Width: Run tape from one side of the window jamb to the other side of the window jamb. You will measure from the inside of one jamb to the inside of the opposite jamb because windows can warp and skew over the years, measure at the bottom, middle, and top. Hopefully, all measurements will be the same or within 1/8". If not, choose the smallest measurement as your "keeper." Height: Same routine here but do it vertically. Again, you measure from the inside of the sill (that is, top) to the inside of the top window jamb (that is, its bottom-most face). Measure the left, middle, and right, and choose the smallest measurement. You are keeping the smallest measurements so that the replacement window you order will fit in the opening. Any gaps will be filled in later. When removing the old window, you do not want to damage surrounding materials. Use your pry bar, screwdriver, utility knife, and delicacy to remove the stops and trim. Use the utility knife to slice paint that may adhere the stop to the window frame. Once you have created a gap, switch to the pry bar. Wood shims are great, too, for protecting the surrounding materials when using the pry bar or hammer claw. Do not destroy the stops. Set them aside for later use. After you remove the sash, cut any sash cords or chains (some older windows have these). With weights, it is always preferable to remove them. Note that, as they often contain lead, they need to be handled safely and disposed of properly. If it is not possible to remove them, let them fall into their pockets. Cut away any exposed rope and let the rest fall down. Slide the outside sash down. Remove the parting beads. Parting beads are simply those vertical strips that keep the sashes on track. Discard, as you will not need them again. Remove the outside sash. Do not remove the outside stops. Clean and prepare inside faces of window jamb and sill to accept the new replacement windows: sand splintered wood, patch small holes with wood putty, and fill large holes with tufts of fiberglass insulation. 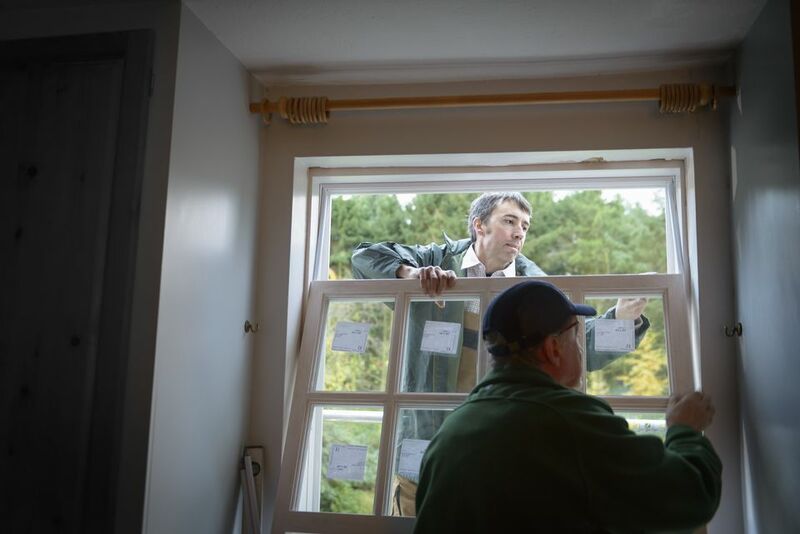 Before nailing, caulking, or any non-reversible procedure, set the new window in the existing window opening and get a feel for how it will fit. See how the shim fit into place. Once the shims are in place, make marks on the wall that indicate where they should go. Friends are great. They support us when times are tough. But if you lean on them too much, you risk driving them away. Shims are much like that. No replacement window will fit perfectly on its own. Shimming is always required if only to raise one side a quarter-inch or so. But if the gaps are too wide and the shimming too expensive, this means that you have ordered the wrong sized window. A tighter, surer, and more weathertight fit can usually be had if you order the next size up in the gapped direction (horizontally or vertically). If you can take the window back to a local supplier and can wait for the new window, this is the best course of action. All replacement windows come with hard plastic, wedge-like supporting clips, typically located in the track above the movable sash. These clips are intended to prevent the sash from moving around during transit and to keep the window square. Unscrew and dispose of these clips right before you install the window. Cover up the hole with the screw that was holding the clip to the window. Caulk the sill with a 3/8" bead of sealant first. Next, put the window in the opening. Use your square to check all four corners for square. Tap in the shims, where marked, to square out the window. Do not knock shims all the way in "flush." Leave about one inch sticking out, because you may need to remove them later. Screw in the provided mounting screws at the top and bottom of each side jamb. Do not over-tighten the screws. Move the header up until it closes any gaps between the replacement window and window frame, and use the provided screws to fix the header in place. Test both sashes for smooth sliding. If the sashes are tight, use the adjustment screws to adjust operation. If this still does not do it, you may have to knock out shims and try shims that are less thick. If the shims are fine, saw off the protruding ends with a miter saw. Caulk inside of the window. Install inside stops that you saved aside with small finish screws.